How do you make your bike seem too much bother to a thief? Choosing the right lock is the best place to start. Bike thieves don’t want to steal your bike, just a bike. That’s the cruel world of bike theft. All locks are breakable in just a few minutes. However, if your bike is more secure than the next one, it’s less likely to be targeted. So how do you make your bike seem too much bother to a thief? Choosing the right lock is the best place to start. If a crim needs particular tools or it’ll take too long to break the lock, or they’ll look obviously suspicious doing so, there’s a good chance they’ll pass on trying to steal your wheels. Most bike thieves take opportunities when they present themselves. 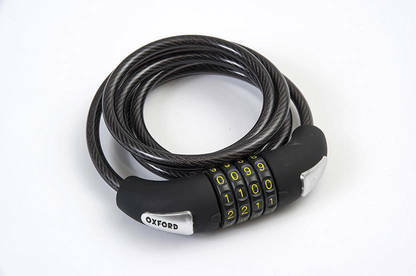 A lightweight cable lock may deter an opportunist from nicking your bike while you pop into the dairy for a couple of minutes, but these types of cheap locks can be snipped in seconds by easily concealed wire or bolt cutters. If you’re leaving your bike for more than a few minutes and it looks more attractive than a beat-up old heap, you need more. This report is free thanks to funding from NZ Transport Agency. How much security do you need? The most secure locks are also the bulkiest and heaviest. That’s because most attacks rely on brute force to break the lock. As long as a lock has no particular weak points (such as a vulnerability to “picking”), a thicker lock takes longer to bust open or cut apart. There are 3 types of secure lock to consider: U, chain and folding. But how can you tell which models are the most secure? The main lock manufacturers rate their locks using in-house security scales. While that’s useful to understand the hierarchy of locks from a particular brand, we recommend choosing a lock that has been independently tested and rated by ART in the Netherlands or Sold Secure in the UK. The ratings are usually shown on the packaging, or even on the lock. Check the list of rated locks on their websites: soldsecure.com and stichtingart.nl. Both organisations test bicycle locks and rate them based on the type and length of attacks they can withstand. ART rates locks on a one- to five-star scale, while Sold Secure awards bronze, silver or gold ratings. A two-star ART rating is roughly equivalent to a silver Sold Secure award and the minimum you should look for. The ART rating test is tougher, so while Sold Secure rates the highest-security locks as “gold”, the same locks tested by ART get 3- or 4-star ratings. There are only a handful of ART 5-star locks and all are heavyweight chains and padlocks; none have been tested by Sold Secure. The 2 big brands widely available in New Zealand retail stores are ABUS and Kryptonite. Both have multiple models rated by ART and Sold Secure. You’ll also find rated models from AXA, Giant, Knog, OnGuard and Oxford. Relatively lightweight for the level of security they offer. Reasonably convenient to carry on a rack or in a backpack, and many come with a bike mount. Can provide a high level of security. Have a good price/security ratio. Easy to use with accessory cables. Limited versatility – bike needs to be positioned close to the locking object. Won’t fasten around objects wider than approximately 100mm. The best balance of price, security and convenience for most people. But not so versatile in use and may limit where you can lock your bike. Steer clear of cheap unrated models. Chains with links up to 10-12mm thick are portable, if heavy, and easy to carry wrapped around your bike seatpost. Versatile to wrap through your bike and around the fixed object. Chains with integrated locks are easy to use. Can be as convenient as a cable, but offer much better security. The best chains, with links 14mm thick or more, offer the highest five-star ART security ratings. Thinner chains offer less security – it’s unlikely a chain with links thinner than 7-8mm will be ART or Sold Secure-rated. Thicker chains are more secure, but less convenient to carry. Chains with links thicker than 12mm weigh upwards of 3kg. Heavier chains and those with separate padlocks are cumbersome to use. For similar security, a chain is heavier than a U-lock. Portable integrated chains are easy to carry and use, but look for chains with at least 7-8mm link thickness. They will be heavier than an equivalent U-lock. A good chain lock with links thicker than 12mm offers the best security of all locks. But they are impractical to carry and best left in a location where you regularly lock your bike for long periods (such as a workplace bike cage). Folds into a small package. Very easy to carry, usually in a bike-mountable case. A little lighter than a U-lock for similar security. Can be cumbersome to use (multiple folding links can be frustratingly wiggly to wrap through your bike). Ultimately limited security due to complex riveted construction. A folding lock can offer the security of a good U-lock, but with more versatility. 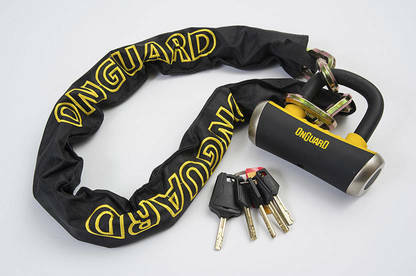 They are easier to carry and can lock your bike to objects that would defeat a U-lock. But they can be fiddly to use and are relatively expensive. Versatile. Long and flexible to wrap easily through your bike and around the fixed object. Easy to carry. Relatively lightweight and coils into a small package. Many come with a bike mount. Offers minimal security, can be cut by small wire or bolt cutters. Although cheap and convenient, cable locks offer minimal security. They should only be considered as a secondary lock to secure wheels, the seat and other removable items to your otherwise securely locked bike. Armoured cables are the only type of cable lock worth considering. They can offer good security, but the best are bulky and as heavy as a chain. Another drawback is they aren’t as easy to use as an unarmoured cable (the cable armour prevents the lock from coiling into a small bundle). 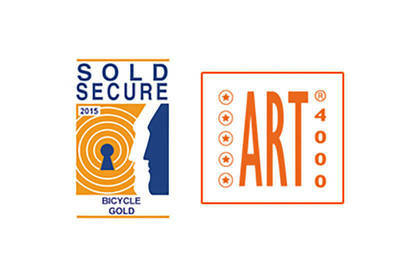 We’ve listed all the bike locks rated by ART and Sold Secure that are available here. Our listing includes lock type, the security rating, a guide price, and indication of where to buy. We found a relatively limited selection of secure (rated) locks available in New Zealand. Most bike stores we visited had just 2 or 3 on display alongside a broader selection of cheap cables and unrated chain locks. An alternative is to look at motorcycle stores, which often carry secure chain and U-locks suitable for bike use, alongside heavier chains more suitable for locking motorcycles. We have also listed locks readily available from three overseas online stores for low-cost delivery to NZ: wiggle.co.nz in the UK offers free delivery for orders over $85, chainreactioncycles.com in Ireland has free delivery for orders over £50 (NZ$91), and pushys.com.au will ship a rated chain lock to New Zealand for A$21 (NZ$23). We’ve included these stores because many locks would otherwise be unavailable here. As with all overseas purchases, you won’t be covered by the CGA if anything goes wrong, and warranty claims may be difficult to process, so consider that when weighing up your purchase. We’ve not included prices as they change regularly and are subject to fluctuating exchange rate. But they are often cheaper than you’d expect to find in a local store. Key or combo? Keys are more secure – all keyed locks need some sort of tool to break them. Carrying your lock. Many U and folding locks come with a bike mount bracket. Check it fits your bike (and there is space to fit the lock), holds the lock securely and that the lock doesn’t rattle when mounted. Chains can be wrapped around your seatpost. Otherwise, you’ll need to carry the lock on a rack or in a bag. Accessory cable. Some U locks come with an extra cable to lock wheels and accessories. 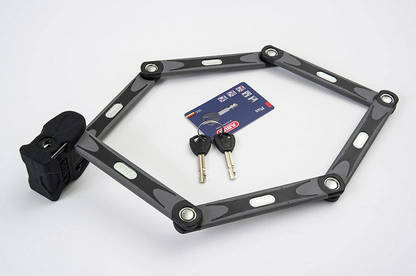 While this may stop an opportunist swiping your wheels, it doesn’t add any extra security to your bike. A better approach is to secure the rear with your main lock and use a second secure lock to fix your front wheel to your frame. Bike thieves usually apply brute force to break a lock – smashing, bending or cutting. So what else are you up against? Wire cutters. Easy to conceal. They can cut basic cable locks strand by strand. Defeated by armoured cables or anything solid. Hacksaw. Obviously suspicious to use, but can cut cheap cables in seconds and, with time, can get through most cheap, unhardened locks. It’s more difficult to cut chains and locks that can’t be held still. Hammer. Brute force at its simplest. Not usually effective on anything other than cheap locks. Bolt croppers. Perhaps the most commonly used tool. Smaller 8”and 12” versions are easy to conceal and effective against all types of cheaper locks. More secure locks (with thicker bars and links) need bigger bolt croppers (up to 36”) and some skill to use them effectively. Long handles can be braced against the ground for extra leverage, so lock with your lock off the ground. Scaffold pole or crowbar. These are inserted through the lock, then twisted or wrenched against something solid until the lock breaks open. The thief is unlikely to care if your bike gets damaged. Bottle jack. These are in the realm of the professional thief. They use a similar approach to a bar, but with the power of a car jack. 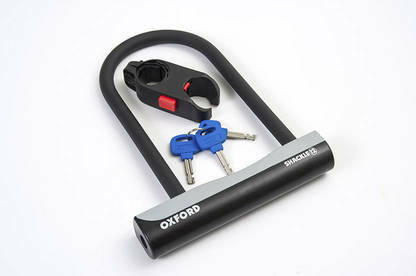 They are most effective against U-locks, and defeated by filling the space inside the lock with the bike and the fixed object so the jack can’t be inserted. Cordless angle grinder. They make a lot of noise and sparks fly. It’s obvious your bike is being stolen, but it’s also unlikely a passer-by will stop and question a determined thief with a power tool. While it may take a minute or more to cut through the lock, and perhaps need two cuts to remove a good lock, eventually an angle grinder will always win. Thicker locks take longer to cut. Most bike thieves are opportunists. They’ll have just basic tools or even none at all – their decision is made by you making your bike easy to steal. They may have a small pair of cable or bolt cutters. The opportunist with large bolt cutters and/or a crowbar is more prepared, as such tools are harder to conceal. They will target any bike, looking for those secured by a puny cable, chain or U-lock. No bike is too rough to get overlooked and they can strike anywhere. The good news is that they are deterred by a good chain or U-lock. “Professional” thieves come prepared and target expensive bikes. They may carry multiple tools, have experience in picking locks, and perhaps have a van nearby to carry away stolen bikes. They are willing to spend time breaking locks – they know few passers-by will raise any alarm. Your best shot at defeating them is to make any attempted theft take a long time (multiple good locks used correctly) and increase the chance of detection (lock in a public place). Realistically, you’d be rather unlucky to have your bike attacked by a “professional”, unless you regularly leave a very flash bike in a high-risk area. Lock your frame It’s obvious, right? Lock your bike frame, not just a wheel, to the fixed object. If you can, lock your frame and the rear wheel to the fixed object. Keep the lock off the ground Attacks with a bolt cropper are made more effective if one handle can be braced against the ground. Raising your lock off the ground means it is harder to get leverage to generate the forces needed to break a good lock. But also avoid locking just your top tube, as that allows the bike to be used as leverage. Best practice is to lock high up on the down tube and rear wheel. Make the lock hard to get to Lock with the keyhole pointing to the ground to deter picking or tampering. Position your bike and lock close to others in a rack. If it’s less convenient for you to lock and unlock, it is also less convenient for a thief. Pack the lock full “Fill” the inside of your lock with the bike, a wheel and the fixed object. This denies space for a thief to insert a bar or jack, making it harder to break the lock by twisting. It also prevents them from manoeuvring the lock into a better position for them to cut. Secure your accessories Don’t overlook your wheels (see Securing your wheels and seat), lights or anything else attached to your bike. If they aren’t bolted on, lock them to your bike or take them with you. Use 2 secure locks Best-practice locking uses two locks – taking twice as long to break. Gold-standard locking uses two different locks needing different methods to break. Choose a busy place Busy streets make it riskier for the thief to be noticed and caught. If there’s CCTV, it’s even better. Don’t get fooled into thinking “out of sight” is better. Lock in the middle of other bikes The coming and going of other cyclists is off-putting to a thief. They don’t want to get disturbed, and a fellow cyclist is more likely to raise the alarm than a general passer-by. One of those other bikes may also look more attractive or easier to steal than yours (you don’t have to outrun the bear, just the person next to you). And if yours is in the thick of a bunch of bikes and harder to access, it is harder to target. Lock to an immovable object It sounds obvious, but the fixed object you lock your bike to should be truly “fixed” and less easy to break than your lock. Avoid locking to thin railings, wooden posts and aluminium signs. Make sure your bike can’t be lifted off the post. And look out for roadside parking signs in cities and towns – these can often just be lifted straight out of the ground! If you have no choice but to lock your bike to something less secure, lock through your frame and rear wheel, because, even if your bike is removed, it will be unable to be ridden until the lock is broken. Don’t leave clues Don’t make it obvious you’ll be gone for a while. Lock your bike away from the cinema or sports centre. Beware of leaving your bike in workplace bike cages or on racks at bus or railway stations. It’s very obvious your bike will be there for a while, so treat these places as high risk and likely to be targeted by more organised bike thieves. Use an extra lock. Wheels and saddles get stolen because they are often secured by quick-release skewers. While these make it convenient to fix a puncture or adjust your seat height, they also make your wheels and saddle convenient to nick – a quick-release saddle can be lifted by a thief barely breaking stride. There are two methods to securing your wheels and seat: attach them to your bike using secure fixings, or use a bike lock. Using fixings that need a tool to release makes life harder for a thief. However, these methods also make it harder for you to remove a wheel or adjust a seatpost. Use bolt-up wheels or replace your quick-releases with bolted hex/Allen skewers. Secure, but removed with a commonly available hex key or spanner. Fit a skewer with a unique key (such as a “Pinhead” or “Pitlock”). Very unlikely a thief will be prepared. But you will need to carry the tool around to remove your wheels. Fit “gravity-locking” skewers. These can only be released when the bike is turned upside down. Impossible to remove wheels and seatpost when your bike is locked securely. Still convenient for fixing a puncture, as they release when you turn the bike upside down. It’s best to use your main lock to secure your frame and rear wheel to a fixed object. However, it still leaves your quick-release front wheel unsecured. Use a cable lock extension threaded through your main lock and front wheel. Reasonably convenient, but easy to snip. Remove your front wheel and lock it together with the frame and rear wheel to the fixed object. Very secure, but inconvenient, can damage front fork, needs a long lock and limits where you can lock your bike. Use 2 secure locks – the first to secure the frame and rear wheel to a fixed object, and the second to lock the front wheel to the frame. Best-practice security, but requires two relatively heavy and expensive secure locks. The secondary lock could be rated to a lesser standard than your main lock and still act as an effective deterrent. On many e-bikes you’ll see a lock mounted to the frame behind the seat. It locks the rear wheel, preventing it from turning. 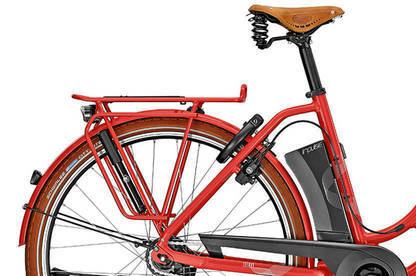 A thief could carry the whole bike away, but it’d be difficult as e-bikes weigh quite a bit. Many frame locks are ART- or Sold Secure-rated. A cable or chain can be plugged into some frame locks to secure the bike to something immovable, though most of these don’t have a Sold Secure or ART rating. 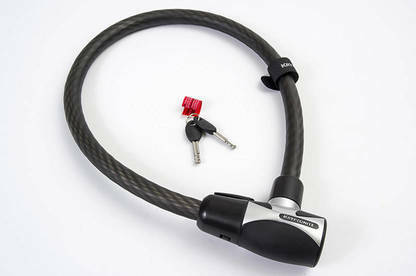 Bike locks often use barrel keys - like used on laptop security cables. Having lost the key to our laptop cable I went on YouTube and quickly discovered that a pencil, sticky tape and cardboard could be used to undo the lock - in about 5 seconds after making the "tool".